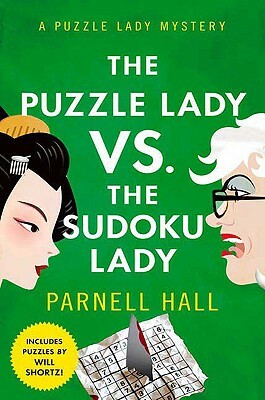 It’s the battle of the century when Minami, the Sudoku Lady, shows up in Bakerhaven, Connecticut, to meet Cora Felton, the Puzzle Lady, whose sudoku books have just edged Minami’s off of the Japanese bestseller list. Before the rivals have a chance to square off, a killer strikes, and a sudoku puzzle is found at the scene of the murder. Now it’s a fight to the finish to see who can unmask the killer. Cora is eager to undo her Japanese counterpart---at least until the poor woman is arrested for murder and Cora realizes that she accidentally framed her for the crime. As if that weren’t frustrating enough, the publicity of her arrest drives Minami’s sales through the roof! Now it’s up to Cora to clear her rival’s name, get her off the bestseller list, and trap the real killer, but she’d better do it fast, before the cops find out what Cora did, and she winds up facing more jail time than Minami. Boasting an entertaining, fun-filled mystery, as well as several satisfying crossword and sudoku puzzles, the Puzzle Lady’s latest adventure makes for a rollicking good read. Edgar, Shamus, and Lefty nominee Parnell Hall is the author of the Puzzle Lady crossword puzzle mysteries, the Stanley Hastings private eye novels, and the Steve Winslow courtroom dramas. An actor, screenwriter, and former private investigator, Parnell lives in New York City.